If weather reports are anything to go by, this weekend looks like another wet one. The best solution to a rainy day, we find, is rolling up our sleeves and doing some baking. Click here for some fantastic cakes, biscuits and dessert recipes. Valentines day is just around the corner. Many people will prefer to go out to dinner on this evening, however why not bypass all the hassle of trying to book a reservation at a crowded restaurant and rather make a delicious home cooked meal for your loved one this valentines, or join us for a scrumptious Valentine inspired Sunday outing at Wickedfood Earth. Click here for inspirational and romantic recipes ideas. This week we review the delightful South African cookbook Veld to Fork where we have a look at exactly where and how certain foods are grown and what to do with them once harvested. 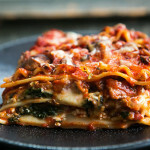 Our recipe of the week taken from Veld to Fork is a tasty and hearty Venison, parma ham and mushroom lasagne. We find out what is new and happening at Wickedfood Earth as well as pop into our Sunninghill School for the latest classes and happenings. Find us on Facebook and Twitter – just search for Wickedfood and you will find us. We update the blog on a daily basis and publish it through Facebook and Twitter. Looking for info on food? If you have any food-related questions, or a dish that you just can’t get right or even a certain recipe that you are looking for, but just can’t seem to find, then contact us and we will do our best to answer it as soon as possible. Click Here for more information. Hope to hear from you soon. The Cooking class programmes for February and March are up on the internet, and bookings are now open. Wickedfood Cooking School, Sunninghill (in red below) runs cooking classes with a minimum of 8 participants and a maximum of 12 giving everyone hands-on experience and keeping the cooking class small enough for maximum learning. At Wickedfood Earth Country Cooking School (in green below) we run full-day Sunday cooking classes and food skills workshops, where each 3 to 6 students has their own fully-equipped cooking station. All our individual cooking classes are conducted by our senior instructors who have extensive experience in the food industry and share a variety of additional cooking tips throughout the cooking class. Sunday 9 February from 9:30am – The perfect roast chicken (R495pp at Wickedfood Earth). Learn the skills of how to roast a chicken perfectly. We will give you a number of great ideas for roast chicken, both in the oven, and how to smoke it in a kettle braai, so that it stays really moist and juicy, with a crispy skin. You will also learn how to cook the ideal seasonal vegetables and salad to go with roast chicken. Friday 14 (full) and Saturday 15 February at 6pm – Romantic Valentine’s dinner, easy summer entertaining (R840 per couple). Join the staff at the Cooking School with the love of your life for a Valentine’s dinner with a difference. Not only will you get to enjoy a delicious 4-course dinner, but you will learn the secrets of how to cook it. Included in the price is a welcome glass of sparkling wine, house wine while preparing the food, and some specialist wines, complementing the food, with the meal. Space is limited. Sunday 16 February from 9:30am – Valentine Sunday lunch (R990 per couple at Wickedfood Earth). Spend a day of pure indulgence with the love of your life cooking up a storm and sampling great food – we show you how to cook the perfect roast leg of lamb with ease. After cooking, enjoy a scrumptious meal including easy-to-do snacks, the lamb, seasonal vegetables and yummy potatoes, sauces and a pudding. Tuesday 18 February at 6pm – Sushi – The basics of sushi making (R440pp – maximum 18, so book early). The increasing popularity of sushi around the world has resulted in many more people wanting to learn the basics of Sushi making, this Sushi cooking class shows you how to do the following, cutting fish, making rice and the basics of Sushi making. Monday 24 February at 6pm – Classic French cooking (R430pp). The French have an ongoing love affair with food, and in this French cooking class we teach home gourmets and enthusiasts alike how to create these wonderful foods with our introduction to classic French cuisine. Sunday 23 February from 9:30am – Seasonal cooking, Vegetables (R495pp at Wickedfood Earth). How to make the most of fresh seasonal produce. This is a great class for both kitchen beginners, as well as those looking for new ideas in the kitchen. With the best of seasonal vegetables available at this time of year, this cooking class will concentrate on delicious vegetable dishes – salads, steamed vegetables, roasted vegetables and delicious vegetable tarts. We have been updating our blog on a daily basis and have built up an impressive amount of fun and exciting recipes and ideas. Click here to have a look at our blog and leave a comment to let us know what you think. We have had a rather busy start to our year and we have been enjoying our classes. We have recently had the pleasure of hosting Corporates such as SOS in a wonderful Bills Food class and Baker Mckenzie in a Spanish class. Click here to take a look at the photos from those classes as well as others that we done. If you are interested our Corporate and team building classes click here for more information or you can contact Cilla on 076 236 2345. At last, rain! After one of the driest Januaries in living memory, February is here with a bang, 200mm of rain in two days, and all the dams are full. Two weekends ago we ran our first class at Wickedfood Earth Country Cooking School – the perfect suckling pig. It was a great success, and has hopefully set the tone for future classes – we already have a follow-up class fully subscribed . The remainder of our suckling pigs are fast reaching slaughter weight of around 7-10kg. If you are interested in one, please contact Cilla. Mid summer is always a time of plenty, and it reflects both in our vegetable garden and in our berry orchard, where we are harvesting bucketfuls of blackberries and raspberries. We run full-day Sunday cooking classes and food skills workshops. Classes are small, with a maximum of 16 students, each 4 to 6 students having their own fully equipped cooking station, to ensure that every student gets to participate in the preparation of every dish. Apart from the cooking classes, students also get to sit down to enjoy a leisurely 3-course meal that they have prepared. The February schedule is on our website, see class overview above. To Book contact Cilla on 076 236-2345 or cilla@wickedfood.co.za. Wickedfood Earth will be running a weekly community country food market from the premises of the Wickedfood Country Cooking School as of Saturday 22 February, from 8am to 10am. The idea of this food market is to link local producers to consumers, as well as provide a location where locals can get together for a quick cup of coffee, cake and chat. All food sold at this market will be seasonal, locally grown and produced. More…. Gordon Wright has had a passion for food since early childhood. He accredits his love of food to his nanny Elizabeth Notwala, who helped raise him as a boy and had a major influence on helping him develop his adventurous pallet. Today Gordon Wright runs the highly acclaimed ‘Gordons Restaurant’ in Andries Stockenström Guest house, a very well known guest house situated in the heart of the Karoo. Click here to read full review. Click Here for reviews of all our cookbooks. This rather extravagant lasagne was found on a slow food tour in Italy by Gordon Wright, author of Veld to Fork. This is what Gordon Wright had to say about this recipe: “I had a most memorable lunch there (The HQ of Slow Food Italy) and was so taken by a similar dish of veal mince, mushroom and Parma lasagne, that I went into the kitchen and chatted to the chef and got the basic recipe. This is my own Karoo adaptation of it using springbok mince and my home-made (f)arma ham and pasta. Feel free to experiment with your own version of this recipe. Have Fun!” Click here for full recipe. MDp5UL I am so grateful for your blog post.Really looking forward to read more. Great. hra04W Very informative blog.Thanks Again. Cool.